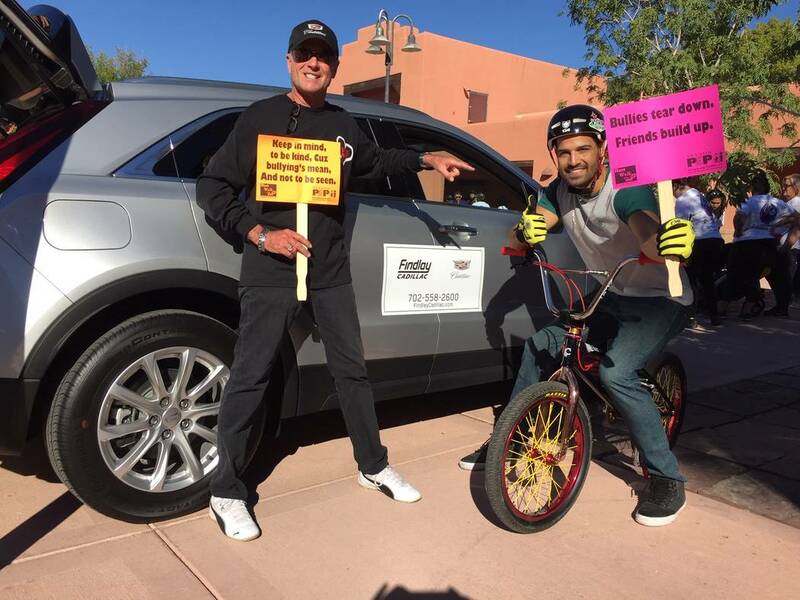 The Findlay Automotive Group sponsored the eighth annual Nevada PEP Run Walk Roll Against Bullying on Oct. 20 at the Sammy Davis Jr. Festival Plaza at Lorenzi Park. The brainchild of Stephanie Vrsnik, community development director for Nevada PEP, the event attracted more than 2,000 Clark County School District students from 40 local schools who joined hands to erase bullying. Participating Findlay dealerships included Findlay Toyota, Findlay Cadillac, Findlay Chevrolet, Findlay Honda Henderson, Findlay Acura, Findlay Honda Northwest, Subaru of Las Vegas, Jaguar Land Rover of Las Vegas and Findlay Volkswagen. Executives from Findlay Automotive Group saluted Nevada PEP for its dedication reaching out to help others. L.J. Harness, Findlay Cadillac marketing and promotions/community involvement manager, concurred that Nevada PEP is tackling a huge problem nationwide, and the fact that the event drew such a crowd was proof that Clark County School District students are also tired of the bullying. The reach of Nevada PEP to help others is very impressive. Vrsnik added that Nevada PEP brought local students into the program by getting community leaders to sponsor schools. Findlay Automotive Group has been a part of the event for the past five years. “The event was such a success because of our team-work effort,” Vrsnik added. “We had more than 90 amazing volunteers that make it all work. Because of their hard work and dedication, it was a success. We are deeply honored to have been sponsored by Las Vegas City Councilwoman Lois Tarkanian and Councilman Cedric Crear. Further information regarding Nevada PEP can be found by calling 702-388-8899. Findlay Automotive Group was founded by the late Pete Findlay in 1961 and has 32 automobile dealerships in Nevada, Arizona, Utah, Idaho, Oregon and California. A 33rd dealership, Findlay Mazda, is currently under construction just south of Audi Henderson in the Valley Automall. Further information regarding Findlay Automotive Group can be found at www.findlayauto.com.